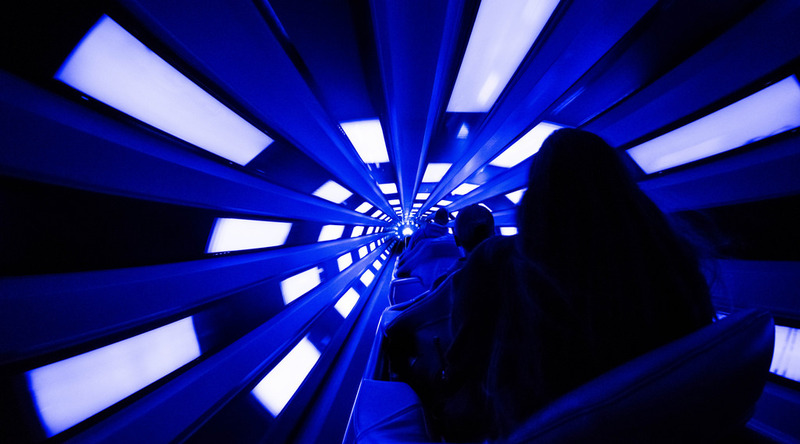 Space Travelers: Welcome Aboard Your Space Mountain Rocket Train | What's the Point? Welcome to this month's Blogorail Black Loop. Today we are sharing some the best attraction ride vehicles at Disney. "Rocket trains in motion, track B!" I remember making that announcement pretty much every shift during my College Program at Space Moutain. What did it mean? It essentially meant guests were about to enjoy one of the best, most exhilarating classic Disney attractions. Your rocket train is your vehicle into the abyss of outer space and the unknown. Almost all of the classic Disney attractions premiered at Disneyland Resort and was replicated years later at Walt Disney World Resort. Not so for Space Mountain. The original Space Mountain stands in Orlando and has been a centerpiece of the Magic Kingdom since 1975. However, if the rocket trains look familiar, that's because they were modeled after the Matterhorn bobsleds. Like the Matterhorn, guests would share the train with a partner, sitting two by two. This was (thankfully) refurbished in 1989 and we now have six individual seats. One of my favorite parts of the rocket trains unfortunately was removed during Space Mountain's recent refurbishment. While you were previously waiting in line, you used to be able to see the rocket trains glowing in the dark as it navigated the tracks above. There are 30 rocket trains split between the two tracks, each individually numbered from 1-31. Why 31? There's no train 13, even though cast members will tell you about ghost train 13. 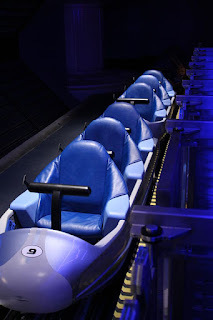 The worst job at Space Mountain is trying to explain to guests that seat three and four (which is split between the two attached cars) is still in the same train. Guests just don't get it. Parents don't want to be "separated" from their children and couples don't want to be separated from their significant others. Seats three and four are important because the goal is to have at least five guests in each train for efficiency. The most requested seat is one, or the front; however, the best seat is the back seat. You get the most movement there, in my opinion. Because the seats are so low to the ground, some guests have trouble standing up in the unload area. This slows everything down and sometimes even is the cause of a ride breakdown. What do you think about the Space Mountain rocket trains? Tell me in the comments below. For more info on the best attraction ride vehicles at Disney, check out the other great posts from the Blogorail!